Yasujiro Ozu died of cancer in December 1963, leaving behind one of the most extraordinary bodies of work any filmmaker has ever produced. Beginning with his silent films of the late '20s, Ozu produced a film virtually every single year until his death with the understandable exception of the mid-'40s. This consistency also makes it tempting to pigeonhole every Ozu film as, well, an "Ozu film" and to overlook the differences among them. 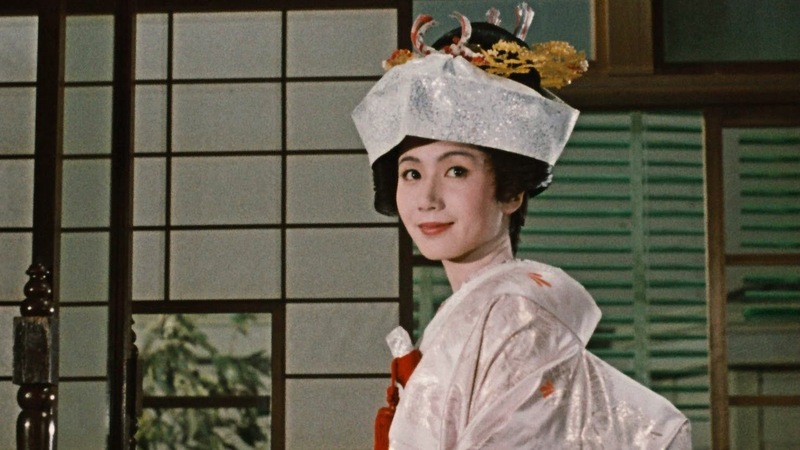 We all know that an "Ozu film" is gentle and sensitive, but then how do we explain the abjection to which Shinji (Tokihiko Okada) is subjected in "Tokyo Chorus" or that deceptively sinister smile that Noriko (Setsuko Hara) wears like a mask in "Late Spring" (1949)? "Late Spring" marks an obvious point of comparison to "An Autumn Afternoon" because both stories revolve around an adult daughter who lives with her widowed father but must now contemplate marriage and the ramifications of leaving her father to live alone. 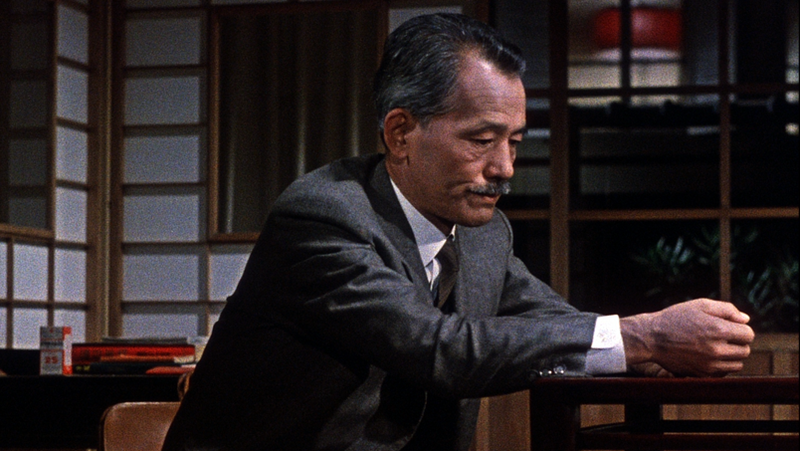 Both films have a mournful tone but, in my (perhaps minority) opinion, "Late Spring" is one of Ozu's darkest films while "Autumn," for all its sad and stoic observation of the perils of aging, is somewhat more hopeful. Which is not to say that that "Autumn Afternoon" is as cheerful as the happy faces its protagonists put on for others. Far from it. 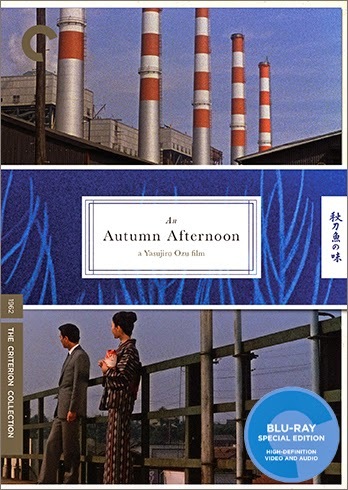 The more significant point of departure between the two films is that instead of focusing on the daughter, "Autumn Afternoon" tells the story primarily from the father's point of view. Chishu Ryu, playing in his 32nd Ozu-helmed film (though not always as a lead), portrays Shuhei Hirayama, a 50-something company man who lives with his 24-year old daughter Michiko (Shima Iwashita) and her slightly younger brother Kazuo (Shinichiro Mikami). Hirayama leads a comfortable, stable life, but often comes home drunk. His secret to relative success is simply not to think about things, but to muddle through each day, expecting nothing to change and being content when it doesn't. Two new occurrences derail his placid fatalism. First, his friend Koichi (Keiji Sada) tells him that he has found an excellent marriage candidate for Michiko. Hirayama is startled because, quite frankly, he has given no thought whatsoever to marrying off his daughter. He gives little consideration to Koichi's suggestion until later when he and his buddies meet an old college professor nicknamed "The Gourd." The Gourd lives also lives with his daughter (who is somewhere near 40) and is a sad, lonely drunkard: neither he nor his daughter have much hope of ever finding happiness again. Hirayama's first reaction is to take pity on The Gourd, walking him home after a good bender and bringing gifts, but he is eventually forced to confront the possibility, no matter how often he tries to deny it, that fate will lead him down the same road unless he lets go of Michiko. Michiko has her own opinions on the matter, and Hirayama is too ambivalent to force the issue. The outcome is inevitable, but no less moving for its predictability. The seriousness of Hirayama's struggle is leavened by the trademark Ozu humor which is a bit raunchier here than in other films. Both Hirayama and Koichi get great mileage out of making fun Horie (Ryuji Kita) who has married a woman half his age. Anticipating the "Viva Viagra" ad campaign by 45 years, the men rib Horie about his need to pop pills and even convince someone else that Horie has died while making love to his young wife. Needless to say, jealousy is at the root of their constant heckling. "An Autumn Afternoon" looks very much like an Ozu film, which means that, yes, many scenes are shot with a static camera from a low angle. But Ozu's films are much more varied than that. He relies on sharp montages as well as long shots, often to disorient the viewer briefly such as a sequence when he cuts to several shots of a baseball stadium before abruptly switching locations. Scholar and uber-critic David Bordwell discusses this in great detail on the disc's commentary track. As is his wont, Ozu ends the film with a series of simple, elegant still shots that, when cut together, unleash a depth of emotion: sad, bittersweet, but not entirely bleak. In this sense (and perhaps only in this sense) it's easy to understand why Paul Schrader lumped Ozu in with Bresson and Dreyer as "transcendental" filmmakers. As the final sequence in Ozu's final film, it's as memorable as anything he's ever recorded, and a fitting way to end a career that ended far too soon. The film is presented in its original 1.37:1 aspect ratio. Criterion released this in 2008 in a pictureboxed format; this fuller image offers slightly more information on each side of the frame. This is a new transfer from the source used in 2008 and the result is, as you may have read elsewhere, noticeably greenish in tint which is assumed to be closer to the original intent and is true for many Japanese films of this era. The 1080p image is sharp in detail but not very grainy. Basically, this is very good, not quite great. The linear PCM Mono track is crisp but best described as strictly functional. There's nothing wrong with it and it's probably true to the source material, but it won't blow anyone away. Optional English subtitles support the Japanese audio. Criterion has imported the slim selection of extras from its 2008 SD release. While there aren't a lot of extras, at least we get a phenomenal commentary track by David Bordwell, the critic of choice for people who choose wisely. His commentary shows his easy command of film language, and focuses on his favorite subject: film style. He offers a bit of history and some narrative description, but mostly Bordwell provides a commentary that helps viewers really see what's happening on screen. He also argues quite persuasively that there is a whole lot more to Ozu than just that low angle camera. The only other extra, aside from two Trailers (2 min. and 3 min., respectively), is an excerpt (15 min.) from a 1978 French TV show “Yasujiro Ozu and ‘The Taste of Sake.'" The slim fold-out insert booklet includes an essay by Geoff Andrew on one side and an essay by the late, great Donald Richie on the other. Both essays were included in the 2005 insert booklet. The difference is the formatting. The old 2005 booklet was a thicker 28-page pamphlet. This 2015 fold-out is slim and has fewer graphics while economizing space. A sign of leaner times in the home video market, I guess. Ozu's final film is also one of his finest. You can understand why Ozu is one of the most-represented filmmakers in the Criterion Collection. This high-def upgrade is perhaps not a definitive must-have for those who already own the strong though not perfect SD release, but it's the easy choice for anyone looking to add this title to his or her collection. The extras are wanting, but the Bordwell commentary is still great.